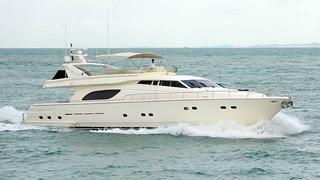 A call to Simpson Marine in Singapore brings another July sale out of the woodwork as Paul Whelan says the 24.56m motor yacht Hye Seas is now sold to a direct client. A Ferretti 80 model built in 1999, she accommodates six guests in three staterooms plus three crew while twin 2000hp MTU engines give her a cruising speed of 15 to 18 knots. Asking $1.7 million, Hye Seas has been renamed Dewa Raci and will remain in Singapore.